When its summer, New Yorkers head to the city’s parks with their seemingly endless offerings including free concerts. 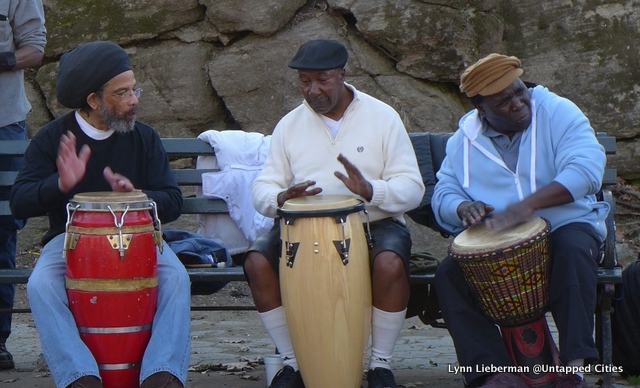 There are tons of sources for public events but we wanted to highlight one you might not know about: the Drummer’s Circle in Marcus Garvey Park in Harlem. Every Saturday afternoon in the summer since 1969, Marcus Garvey Park in Harlem is filled with the sounds of drums, an occasional horn, dancing and a lot of history. This wonderful gathering of musicians has historically been from Africa and the Caribbean. The tradition began in a time when many of the buildings around the park were abandoned, and the park and Harlem were considered unsafe. Today the Drummer’s Circle has become a vibrant mix of ethnicities and Marcus Garvey Park is abuzz with activities from the children’s playground to the basketball court, chess tables, the swimming pool and those that prefer to just relax on a park bench and watch it all. Sometimes there are half dozen drummers and other times there are closer to twenty or more. It is unstructured and the musicians vary from week to week. The instruments might include trumpets, cowbells, tambourines, flutes–often there are women in colorful African clothing gracefully swaying and dancing to the rhythm. This park also has a multimillion dollar amphitheater on the South side which is the site of the Charlie Parker Jazz Festival in August, Classical Theatre of Harlem, many of the Jazzmobile performances, The Harlem Arts Festival in June and the Three on 3 Presents that blows the dome off the Mt. Morris Ascension Presbyterian Church on the third Thursday of every month. But the Drummer’s Circle aren’t on any of the formal scheduled events – they simply show up and start to play at no specific time on any Saturday afternoon in good weather. There is no doubt that the Drummer’s Circle and their Saturday afternoon music was the first musical event this Park ever offered and their music brought people to a park that had once been considered off limits to most. These musicians have seen a lot of changes in their park and their community over the years. They take the onlookers in stride–some are fans and some are not. But it is clear they aren’t doing this for what others think. Drumming is part of their culture and tradition. The rest of us look forward to the musical feast but we are the lucky recipients of a gift shared. No, they aren’t on Twitter and have no Facebook page. You’ll just have to come and see them in person. Take the #2 or 3 to 125th Street, walk one block South to 124th Street and head East until you feel yourself start to dance. Most Saturdays after 2pm in good weather. You can follow AFineLyne on Twitter or on Facebook at Harlem Sketches or Greenwich Village Sketches. Don’t forget to head over to the Untapped Shop.